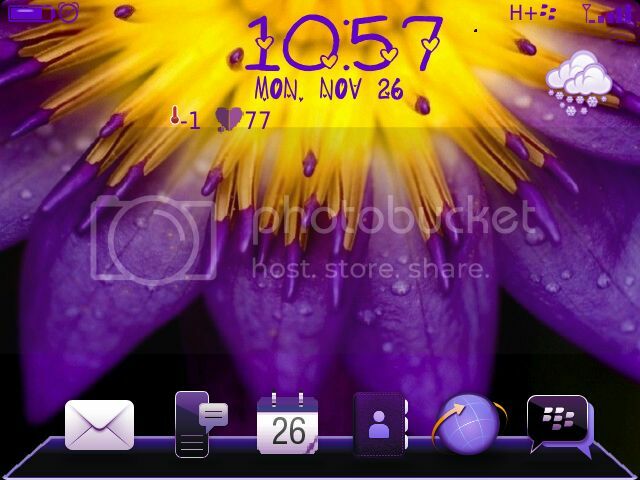 DUE TO LACK OF BLACKBERRY THEME STUDIO 7, THE SYSTEM FOLDERS ARE INVISIBLE WITH ICONS THEY HAVE IN FOLDERS. SO PLEASE USE UNIVERSAL SEARCH FOR FINDING YOUR DESIRED APPLICATION BY ENTERING ITS NAME(FOR EXAMPLE IF YOU WANT TO OPEN PICTURE FOLDER SIMPLY TYPE PICTURE). CALLING SCREEN ARE ALSO DEFAULT ONE. PLEASE NOTE: 9810 HAVE LITTLE BUG OF ICON CUTOFF WHEN YOU BACK FROM LANDSCAPE MODE TO PORTRAIT MODE. TO RESOLVE THIS ISSUE SIMPLY PRESS BB BUTTON ON YOUR BLACKBERRY THEN TOUCH ANY ICON ON HOME-SCREEN IN PORTRAIT MODE AND THIS ISSUE WILL RESOLVE. A very Clean and wallpaper friendly theme, with BIG clock and date on Home Screen. 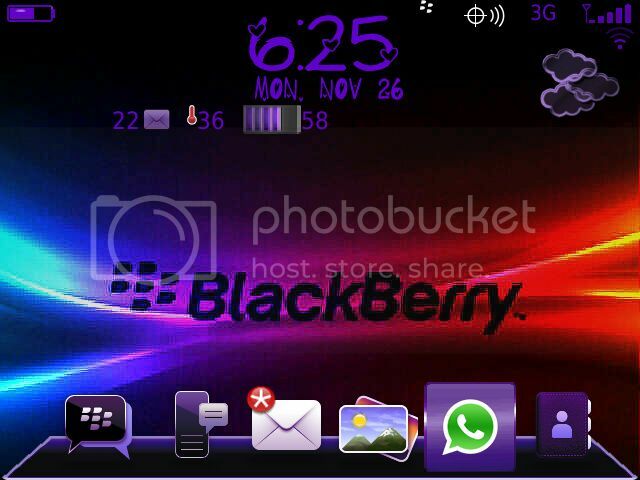 -Original OS7 Icons with purple color. -Almost fit for any wallpaper. -Unique Purple icon for application menu, that suite with theme. Last edited by Abrar0z; 11-29-12 at 10:56 PM. wendybeee and catberryday like this. wendybeee, catberryday, Abrar0z and 1 others like this. catberryday, Abrar0z and SunnyFL like this. catberryday and SunnyFL like this. Triple Dock With Customizable Icons?